Before any of you start reading, check in and decide whether you believe in energy work, past lives, totem animals, or anything else that is considered new agey woo-woo stuff. If you don’t, stop reading now because you will hate this post. If you’re not bothered by what I am about to say, keep reading. It is rare that I write about my energy work. I’ve been told I have a gift, but for the most part people just think it weird or don’t believe me or want a definition of it that I don’t have. Some people think I am a healer, but I never call myself that. For one thing, I am clairaudient and clairsentient, always have been. I am a reiki master, but I don’t like to call myself that either because #1, reiki is too puny of a word for what I do, and #2, I am not a master anything because it’s not about that. Some have called me a “yoga master” but the word “master” embarasses me. I have been told, however, that when I am ready to fully embrace my power, only then will I come into my own. Just like in the yoga biz in the energy worker biz people in the West are impressed by pieces of paper and titles and with whom one studies and who talks the loudest about what they do. Just like in the yoga biz the people with the most letters behind their names are the most successful, “successful” being a relative term. I don’t advertise, never have, and I usually do energy work for free. I do my work mostly in the domestic violence shelter where I teach. The women believe I am a curandera. They don’t need to be convinced by any certificates. People in India “get” what I do much more than anyone here. Indians have a way of accepting siddhis as a natural aspect of the person while Westerners have that uberduality of mind that needs to over-analyze and separate and intellectualize everything. Yes, I said siddhis because it has been written about for centuries in Yoga and Buddhist texts that siddhis naturally arise or are enhanced by yoga and meditation practice. Western uberduality doesn’t track well with Eastern spirituality. Western minds can not accept that sometimes there are no explanations for things. Even energy workers need to visit other energy workers, so I go a woman who is above my level, so to speak. I can’t explain what she does or how she does what she does, I just accept it, but the best way I can describe it is that she gets the mojo down to the cellular level and works on your DNA. For a few months now I’ve been feeling depressed and stuck with my yoga teaching, so much so I have felt like quitting teaching. During my visit with her she used the words “hopelessness” and “despair” to describe my feelings and she felt a deep sadness in me. She asked how I would feel if I quit teaching and the first word that came to my mind was FREE. I told her that I felt my upcoming trip to India was going to be some type of culmination, that I will be finishing a cycle. She agreed. I feel this in my bones just as I had felt for two years that I had to be at the Kumbh Mela in Haridwar in 2010. Nothing was going to keep me from it. According to my natal chart, I will see some big shifts during 2012-2013 — what my astrologer has read in my chart for the last 7 years or so has always been right on. My journey thus far has been a long marinating of the yoga meat and as my astrologer tells me from my chart, I’ve been pregnant for a long time and the shifts will be a birthing of something new and different. We shall see. The energy worker told me that before a jump up the consciousness ladder, the person usually feels they are in their darkest hour and that there is no way out of the black hole of despair. I have been feeling so stuck for months that I felt there was no way out. She did her spiritual counseling and I got on the table for her mojo. Every time she does her work I experience visions and this time was no different, however, I saw something that I have not seen in a long time, something I used to regularly see years ago in meditation: me in orange robes on a ghat on the Ganges but all I saw were my hands and feet. Now I know why the first time I saw a photo of a sadhu on a ghat on the Ganges in Varanasi made me weep uncontrollably — because it looked so damn familiar and filled me with such a sense of loneliness, it was like a longing of wanting to go home. In my mind’s eye I also saw water, as if I was being washed over, like I was being dunked under water like in a Pentecostal baptism. I was underwater on my back and could see blue sky through the surface of the water. I was underwater but it wasn’t scary. It was peaceful and I didn’t struggle and a thought flashed through my mind, “this must be what it’s like to die.” After five trips to India I am finally going to Varanasi, ending my trip there. Then I saw what looked like a segmented egg case or a cocoon, something symbolizing birth. The end of it opened up and in my mind’s eye I watched but nothing came out…then the session ended. I told her what I saw but I knew what I described wasn’t exactly right. On my way home I visualized drawing that segmented thing on a piece of paper and it came to me — it was the segmented abdomen of a female praying mantis, ready to lay her egg case. 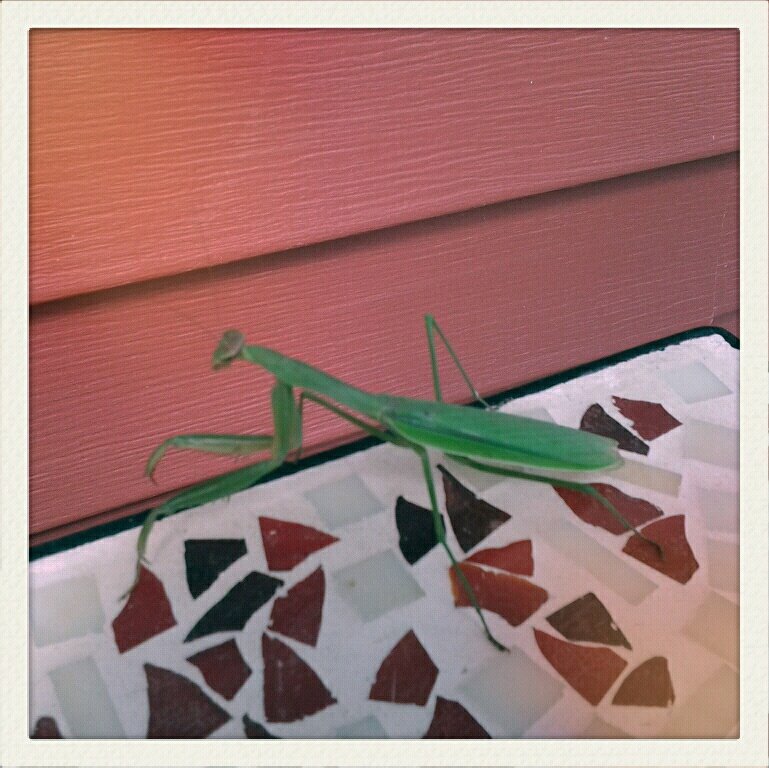 My vision suddenly became crystal clear because a praying mantis made her home on my veranda all summer. Never left. I saw her every day and I watched her slowly die there when it became cold. Of course one can say that she never left because she had plenty to eat — my gardens go up the veranda so she had her pick of juicy insects to devour. But she was always on my door or siding or in the chairs or on the table. I was so tuned into her that I knew when she was dying and I would pick her up and stroke her head and body. I would try to put her in a comfortable spot every day but she always found her way back to my chair. Then one day she no longer moved. “Often they feel misunderstood in that when they attempt to deliver an important message others may shy away from it…. A Native American friend named me Loba because he said wild women and wolves are always misunderstood and feared. The hawk in my yard was always a Red Tailed Hawk and both Pluto and Mars are heavy in my natal chart. My Mars is in Capricorn which relates to my Life Lesson: Responsibility for Self Only. The energy worker told me that my authentic path is ultimately walked alone: it has to be that way because there are very few people who will understand it. Pluto, besides being the planet of Death, is also the planet of Spirituality. My bones tell me why I have been drawn to Varanasi on my next trip, just as sure as I knew why I had to be at the Mela at that particular time in my life. One must die in order to be reborn. Your upcoming changes sound exciting. I’ve always had a thing with animals and creatures, too. Especially dragonflies which are apparently all about change. Linda, this is beautiful heartfelt work—the deep stuff. Thank you for sharing yourself in this way. These are powerful realizations. This is the work of a true healer and teacher. It is very clear to me that you are birthing a new cycle—a new way of being in the world. I honor that you are listening to your intuition and allowing it to guide even though you do not know the end result. I draw strength from your courage and determination. I’m curious, how does your husband feel about all this? I ask because my hubby doesn’t believe in this stuff so I can’t talk to him about it. I always find your posts encouraging because you are a wild woman–I think to myself, “if she’s not afraid to be herself and be lead by her intuition, then so can I!” I hope you continue to share your story here about what you are birthing. I live in an interesting place where there are a lot of “new age whoo whoo” healers offering a variety of services, you see their brochures in all the cafes, but it’s hard to tell who’s the real deal or if it’s just a “career” for them. Do you know what I mean? About the wild women and wolves being misunderstood: when I was kid I did not feel like I was human, I felt different, so I concluded that I had a wolf’s soul trapped in a human body. I didn’t know anything at the time about the mythical and symbolic meaning, I just liked them. and yes, I know exactly what you mean about the “career” healers. People have ALWAYS told me “you should advertise. with your power you’d make a lot of money!”, but for whatever reason that turns me off. Sometimes I think the ones who talk the loudest about what they do have the least to give. Like I said in this post, I rarely talk about my energy work. I know many people who are blinded by the lights of many whom we have all heard about and they tell me, oh, I did a workshop with so and so. And I tell them, that’s nice. Then I think, funny how how they don’t see what’s right in front of them. I have no doubt you are a wolf’s soul in a human body. There are Native American myths like that. I know as sure as I know my name that I was a powerful shaman in a past life, and spiritual adepts have told me that. Once I had a vision as to how I died. A Navajo whose grandfather was a shaman told me I am an Indian in a white body. The funny thing was when I was undergoing the mojo the other day, a shaman was also in my vision of the sadhu (that I knew was me) on the Ganges, they were somehow both connected to me. Or I was both of them. whatever. I don’t over analyze these things. I could have written this myself! Just had the conversation on a FB post the other day regarding the word MASTER too….and all of the energy work stuff, Vedic Astrology……I’m all over it! As you know, I understand where you are coming from in the yoga biz, but I feel I understand where you are coming from on a much deeper level than that. A fascinating read. Quite often i spot hawks in trees, in my presence, etc. and back in August when I arrived home, I had a hawk sitting on my front porch -TWICE in one week, I live in suburbia so I thought it was a sign that I was asking for about one of my son’s friends/teammates. The sign I interepreted was that the Eagle (team mascot) would indeed return to his academic home for his senior year (this boy had been in the said school since 1st grade). There was turmoil in his home and I feared that the best place for him was to stay with his school family-to keep him happy and on track. Now I am intrigued by all of this. But then again, I am no healer. Thank you for sharing these very powerful and personal insights, Linda. It takes a lot of courage to open up to the world about the less widely accepted aspects of spiritual practice and the path, but it is so empowering to do so — not just for oneself, but for others also. Reading this piece inspired me to be more open about my personal experiences on my blog. A mantis came to me this morning- not only confirming the meditation and dreamwork I started last night was the right path for me, but also led me to your blog which adds that much more umph to the signs that I’m going in the right direction. i have regular dream-visits from my own totem animal. 🙂 powerful.